Katie took her first swing class in 1998 and has been teaching at EUSDS with Jamie since 2000. She also teaches at Edinburgh Swing Dance Society on a regular basis. She and Jamie make up the teaching and performance team The Swing Doctors. Musically trained from an early age, Katie has a particular appreciation of rhythm and chord structure and plays a leading role in classes on understanding the structure of swing music. She has taught piano at various times and is experienced at teaching on a one-to-one basis as well as at teaching larger groups. Katie, like Jamie, prefers social (rather than competitive) dance and places great emphasis on lead-follow communication. She particularly enjoys teaching beginners, and considers it a privilege to help people dance their first ever steps. 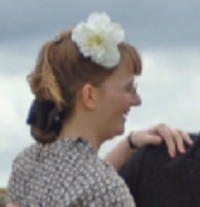 She is proud to carry on a long-standing tradition of passing on the love and knowledge of swing dance on a voluntary basis, in Edinburgh and elsewhere.